Arguably the biggest new story in racing last week took place off the track. I am talking about Claire and Paul Rooney’s decision to stop having runners at Cheltenham, for the foreseeable future. In this week’s post I have some thoughts on the subject. I also look at two top-class performances yesterday from Plumpton. From two horses that we’ll be hearing a lot more of during their careers. There was much talk in the racing press as well as the various online betting forums about the decision by leading owners Paul and Claire Rooney not to run their horses at Cheltenham for the foreseeable future, due it said to concerns over the number of deaths at the track. As a point of information 78 horses have died at Cheltenham since the start of 2010. Far and away the track with highest equine fatality rate. The racing community, as is normal in such situations, closed ranks against the owners. The comments ranged from describing the pair as narcissistic attention seekers to they a duty of responsibility towards the sport, its image with the wider public as a whole. Now both those viewpoints have merit. However, they are the owners of the horses, they pay the bills, and can decide where they want to. In recent years the Rooney’s have lost both Starchitect and Melrose Boy at Cheltenham. Indeed, the former’s death has probably had a huge bearing on their decision given how tough it was to watch. Were the Rooney’s, right? For me, yes. Not only do they pay the bills but they may well be privy to information about horse welfare that their critics and I don’t have. A few more Starchitect’s at Cheltenham and it won’t be long before one of Britain's leading newspapers begins a campaign to ban NH racing, which has now occurred, in all but one state in Australia. It’s not often that my look back at the weekend’s best performances takes me to Plumpton. This week it does. As two horses put up outstanding performances in their respective races. The first came from Master Dino. The French trained 5-year-old beat Knocknanuss in a cracker of a novice chase. The second put in a good performance too. Jumping really well from the off he was only headed by Master Dino after the second last. Trying to give 5lb to what is an undoubted classy young chaser in the making was a great effort from the 9-year-old. He was just run out of it by a stronger stayer. He will win a good race this season. Gordon Elliott sent over Glenloe for the race. The 8-year-old who finished second in last year’s 3m Pertemps Final at Cheltenham was making his chase debut. The 2m 4f at a track, like Plumpton was always likely to prove short enough for the Elliott horse and so it proved. He was making a bit of headway from the rear when making a bad mistake four out. Any chance he had, went there, and he was allowed to complete in his own time without being subject to hard race. Even if he hadn’t made that error he would probably have finished 3rd at best. Still it was a nice introduction to the larger obstacles for him and a return to 3m should see him get into the winner enclosure. Master Dino was the star of the show though. An impressive winner on his chasing debut at Auteuil last month. He wasn’t as bold at his fences as the runner-up but he was accurate and economical. The jockey had to briefly chase him along coming to two out but once he took it up after the second last he never looked in danger and eventually pulled away to register a comfortable 7 length victory. Not surprisingly he was made ante-post favourite for the JLT Novices Chase at Cheltenham Festival on the back of this win. It will take a good one to lower his colours come March. The Two Amigos produced the other top-class performance in landing the Sussex National. The 7-year-old has been a bit of a revelation since going chasing with form figures 1211. Leading most of the way, he was given a race by the Calin Du Brizais but he was always travelling and jumping better than the eventual runner-up. He’s a strong chasing type who can carry big weights as he showed here under 11-12 and had done previously at Exeter. According to his trainer he would have preferred softer ground than he faced on Sunday. He will go up a bit in the weights for this run but the bigger the stamina test the better he is. He should stay 4m and can go well in some of those long-distance handicaps chases later in the season. The 2020 Grand National Winner maybe? Happy Diva, trained by Kerry Lee, has been one of the few positives in what has been a tough few months for the stable. The daughter of King Theatre won three times over fences last season and looked set for a good campaign when finishing runner-up to Mister Whitaker at Carlisle. The mare then ran in the BetVictor Gold Cup at Cheltenham. She was brought down four out that day, when still travelling well enough. The 8-year-old returned to Cheltenham last week finishing runner-up to Aso. It was a good run given the trainers form. Even more of a positive was that she ran a career best according Racing Post Ratings. All her best form has come on softer ground, than she faced last week, and with two or three previous runs in the last 90-days. When getting those conditions she is 5 winners from 8 runners 63% +7.1 8 placed 100% with her form figures being 11211212. Looking forward to the weekend. Saturday’s biggest race is the Classic Chase, a handicap over 3m 5f. It’s Warwick’s biggest day of the season and ‘Classic’ is the tracks most famous race. Here are a some notable trainer records in the race. 2:25 – Wot A Shot, won over C&D back in December 2017 and can now race off a 5lb lower mark. Granted the 10-year-old hasn’t run particularly well on his two starts this season, excuses last time as the ground would have been to soft at Market Rasen. Good ground is the key to his chance with the sounder the surface the better. At around 5/1 he looks worth a bet for a trainer whose horses are going well. The role played by the jockey is never mentioned when safety and equine fatalities are mentioned. The standard of horsemanship is the lowest I can remember in 50+ years of following NH racing. The only two jockeys of the current crop that I truly trust to get a horse from one side of a jump to the other are Nico deBoinville and Bryony Frost. just awsome knowledge Sir !! There we go! 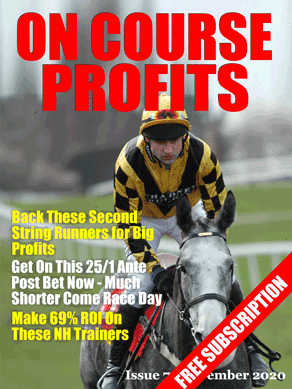 Free £5 bet loaded on at 4/1 on your selection – nicely done John!…Great start to the New Year and week. Hoping Emma Lavelle has a runner in the ‘Classic’, her horses are running extremely well at present. Just looking at the 5-day decs and she doesn’t have one entered. So no joy there. Looks like the going will be good good to soft at worst. That’s a very valid point and something I will look at in a future column. Can’t say I have anywhere your 50+ year knowledge of the sport. But there are few Johnny Francombe’s out there that’s for sure.